On today’s Microsoft Mechanics, we take a tour of the latest updates to Microsoft MyAnalytics. Catherine Pidgeon shares how to use MyAnalytics to improve work impact and success. From understanding where her time goes, to identifying areas of opportunity and gaining insight into collaboration with her most important groups, Catherine provides a comprehensive tour of current and roadmap features. Also, today we are announcing the availability of external contacts within your MyAnalytics experience. Now you will be able to stay up to date on how you interact with important contacts outside of your organization. Whether they are customers, partners or external staff—sometimes those you work with across organizations are the most important to your success. 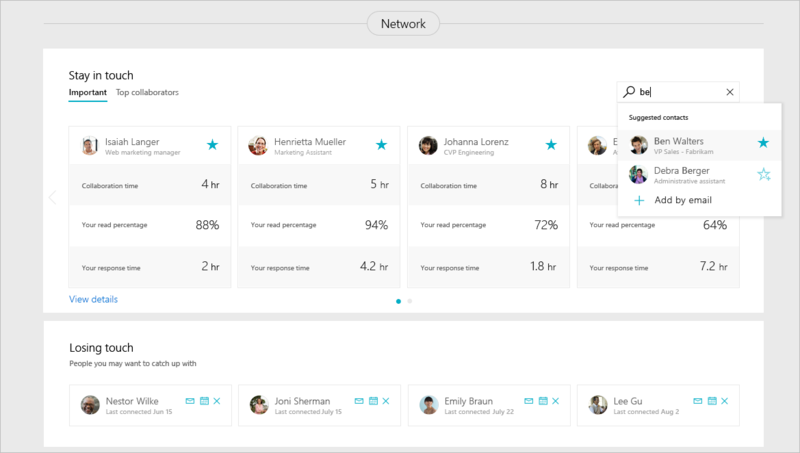 Now you can quickly add important external contacts to your MyAnalytics dashboard to stay updated with collaboration insights like total collaboration time, time in meetings, read percent and response time. Starting in January, the MyAnalytics email digest will deliver time and network insights right into your inbox. The digest will provide insight into your time and progress against goals to help you identify key trends that might require your action. With the quick insights delivered each week, you will now be better informed to plan ahead and ensure you’re spending your time in ways that are aligned with your goals. Already have MyAnalytics? Send us your feedback in the comments, on Twitter @_MyAnalytics­ or via the MyAnalytics UserVoice. Would you like to see your own MyAnalytics view? Start up a free E5 trial today at office.com/E5. Q. How do I add an external contact? A. Use the “search to add” field of the network section in your MyAnalytics dashboard to add external contacts by their full, valid email address. Q. When will the groups feature be available? A. The “My important groups” feature is currently in development and will be available for customers in the first several months of 2017. Q. When will the digest email be available? A. The digest email will start to roll out to customers in early January 2017. Q. How is privacy handled within MyAnalytics? A. Most of the information provided within MyAnalytics is already available to you, such as your time in meetings or your response time to others. In the case that this information is not already available to you, such as the company average time in meetings, the insights are aggregated and de-identified to preserve end-user privacy. Additionally, organizations have significant controls to ensure that MyAnalytics meets the privacy requirements of their organization. 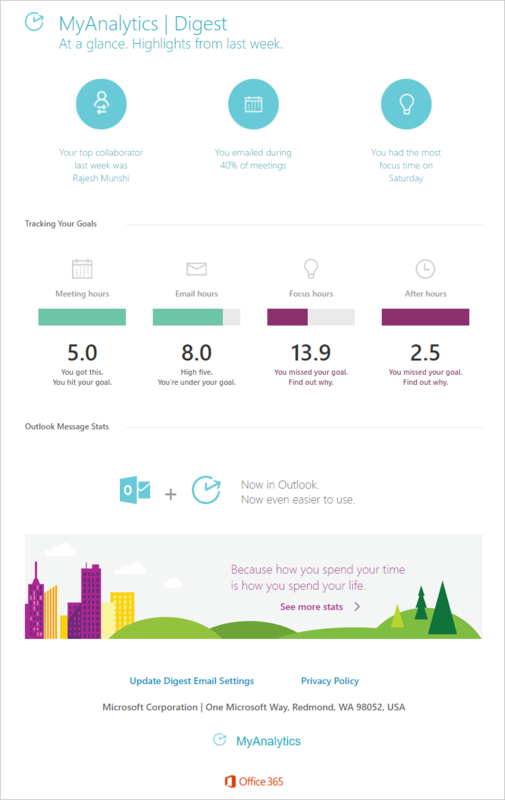 See MyAnalytics for Office 365 admins for more information. Q. I am an end user in an organization that has MyAnalytics and I want to learn more about it. Are there any reference materials available? A. To learn more, please visit MyAnalytics tips and stay connected via our UserVoice, Twitter @_MyAnalytics­ and the MyAnalytics group on the Microsoft Tech Community.